Budapest, Hungary’s capital city, is one of my favorite cities in the world. There’s so much to see, do and eat that figuring out the best things to do in Budapest can be overwhelming. Fortunately for you, I’ve collaborated with a bunch of fellow travel experts to bring you this guide detailing the best things to do in Budapest! From can’t miss main tourist attractions to lesser known suggestions from locals in the know – we’ve got you covered for what to do in Budapest! 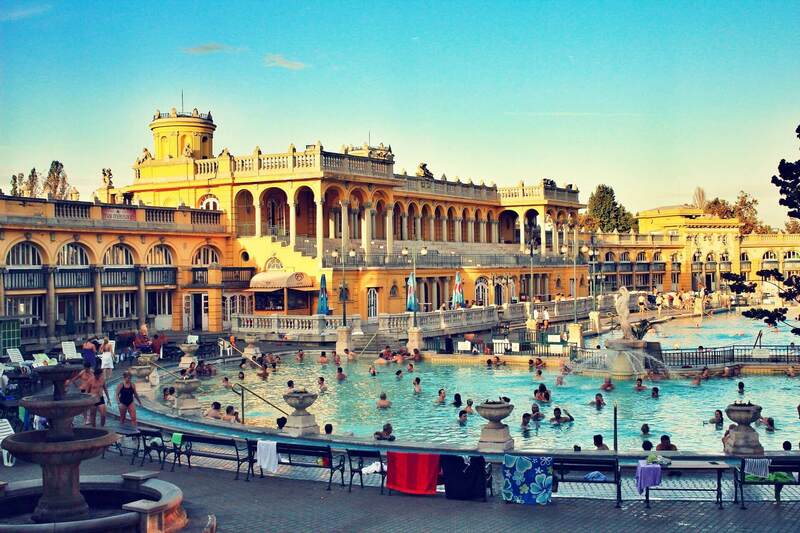 No trip to Budapest is complete without a dip or two in one of the city’s famous thermal baths. If you have to choose one, I recommend the iconic Széchenyi Thermal Bath. One of the biggest spa complexes in Europe, this was the first bath to open on the Pest side of the city. The building itself is stunning. From the outside, it looks like a palace, and inside you will find 21 swimming pools, a sauna, massage, a restaurant and a cafe. 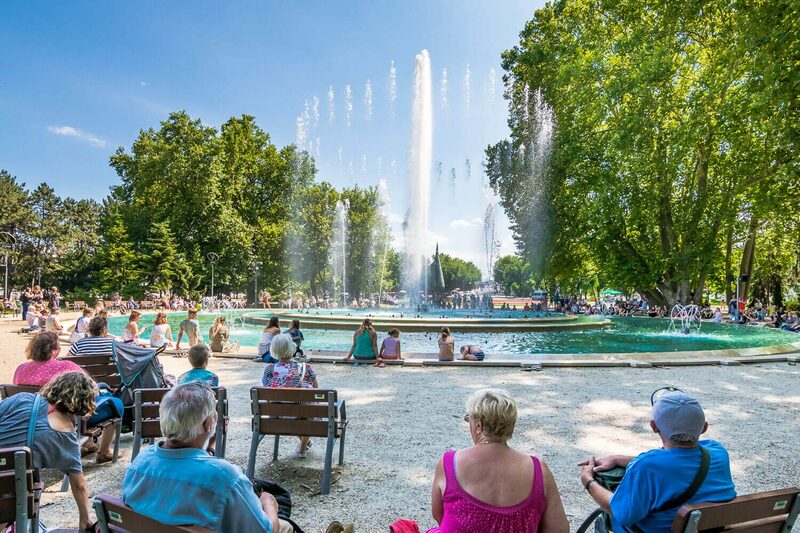 But the outdoor pools are what make Széchenyi one of the top places to visit in Budapest. Whether it’s winter or summer, the outdoor area is made magical by stunning architecture, warm pools, chess tables, and everything you need to relax, even if you are surrounded by hundreds of other people. The bath is open daily, for women and men, from 6 am to 10 pm. Price ranges from 5,900 Ft ($20 USD) to use the facilities to 2,000 Ft ($7 USD) for the tour but no swimming. My advice? put your swimwear on and spend at least a couple of hours there. You won’t regret it. 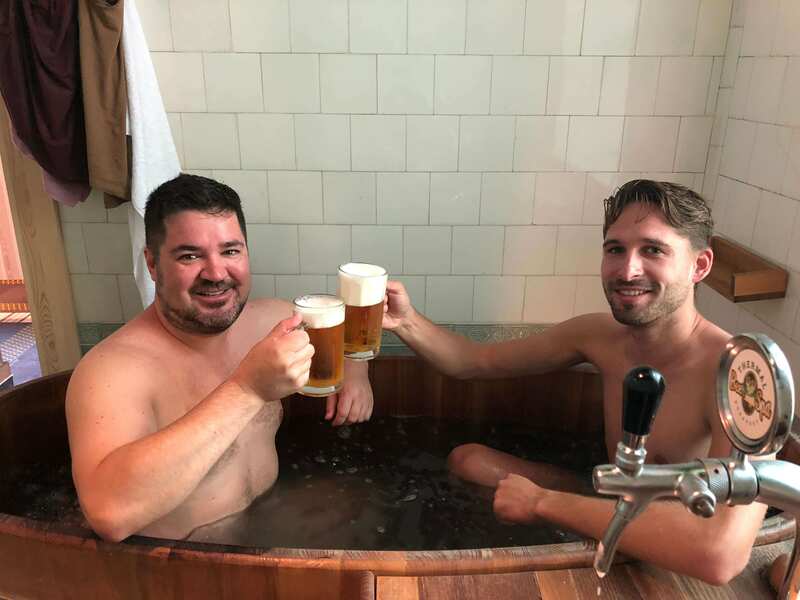 Also, attached to the Széchenyi baths is the Thermal Beer Spa, where you can soak in a bubbling bath of actual beer ingredients, including malt, hops and yeast. The beer spa is said to help rejuvenate your skin, reduce the appearance of acne and cellulite, and clean your pores. It also provides vitamins, sugars and proteins that help your body release muscle tension and can even reduce stress, improve blood circulation and eliminate damaging substances as well as increasing heart activity. Also, it’s said to be a hangover cure! And, while you soak, you can enjoy a tap of ice cold beer with all you can drink beer during you spa session! Be sure to note, though, that this beer spa requires an additional ticket purchase. While Szechenyi and Gellert thermal baths get most of the tourist love, and for good reason, there are many other public thermal baths left by Ottoman occupiers centuries ago. Király Bath may be a bit more run-down than others (though a renovation, the first since the 1950s, is under way), it’s also cheaper and it offers a glimpse into the city’s Ottoman past by way of an old health facility. Patrons tend to be local seniors, which adds to bath’s off-the-beaten path charm. I’d recommend you visit the bath, located under Castle Hill, early in the morning. You can sit in the fragrant mineral water filling the 36°C octagonal main pool and gaze up at the sky filtering through the holes in the round dome. This is the cheapest and easiest trip through the centuries possible. By contrast, Rudas Bath, located at the western end of Elizabeth Bridge, is bigger, better, and busier. Night bathing, available on Fridays and Saturdays, offers a respite from the masses, particularly after midnight. Choose between six pools, three sauna rooms, and two steam rooms for a magical thermal bath experience that combines Ottoman with modern. Then, celebrate the trip with a shot of apple or pear brandy at the Rudas bar by the bath’s entrance. 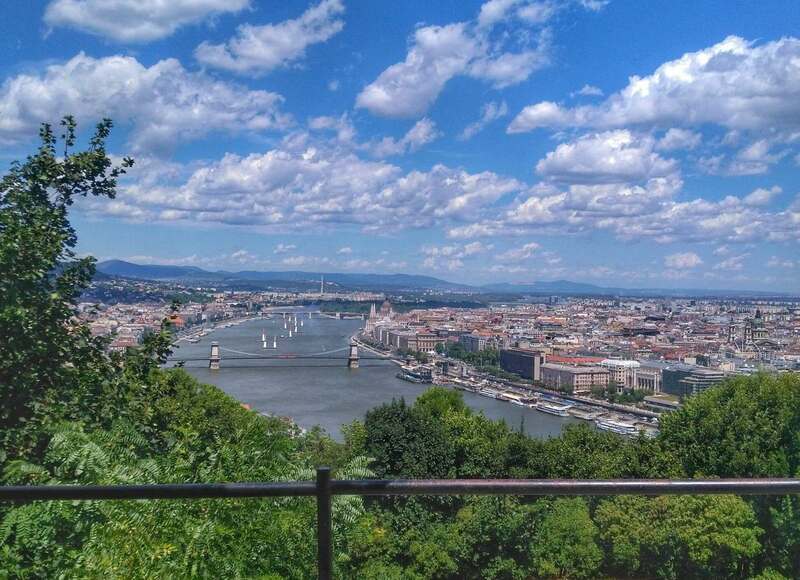 If there’s one viewpoint you need to seek out in Budapest, it’s Gellert Hill. The summit is home to the Liberty Statue, which you can spot from all over town (especially near the Danube). This hill is the perfect spot to admire Budapest from above. From Gellert Hill you’ll see Parliament, Buda Palace, Fisherman’s Bastion, the Chain Bridge, St. Stephen’s Basilica, and of course the Danube River snaking its way through it all. The view is truly epic…and for best results, I recommend you go at sunset. Watching the sun sink over Budapest as the lights of the city flicker on is a magical experience and one of my favorite memories of Budapest. The monuments, buildings, bridges, and even boats light up the night and create an unforgettable mosaic best admired from above. The striking Gothic Revival Parliament. The stone and iron Chain Bridge with its monumental lions. The green metal Liberty Bridge and marble white Elizabeth Bridge. The Danube that connects Buda with Pest. Even a distant view of Buda Castle and the coned spires of the Fisherman’s Bastion. All these are among the most photogenic wonders in Budapest. There’s one way to take it all in without such large crowds — a hike up Gellert Hill. The trail begins adjacent to the luxurious Gellert Hotel and Baths. On a fine spring or summer day, this is the perfect place to burn off all the langos you’ve been eating! Pause at the first vista with the statue of St. Stephen or continue up to the Citadella at the summit. The choices are yours. Feel free to improvise and meander along a number of different trails. This is the best location to take in Budapest at a gentle pace as you learn about the significant role the hill’s fort played in Hungary’s most eventful and turbulent moments. The quiet serenity of this location today seems surreal when you consider its past. The views over the river offer plenty of photographic inspiration. If you want to find the best location in Budapest to get a feel for the city on a clear day, then look no further. Once you go up, you might not want to come down! Atop Gellért Hill lies the Citadella, which means citadel or fortress. The fort is easy to reach with the Hop On Hop Off bus pass, as there is a stop on the route. However, you can also walk if you fancy a bit of fresh air and some exercise. It should only take about 15 minutes to get up to the top. There are two reasons this is one of my favorite things to do in Budapest. One: it’s free! And two: the views are breathtaking! You’ll get perfect views (which, I dare say, are better than those from Fisherman’s Bastion!) of the River Danube, along with the Chain Bridge, Margaret Bridge, Hungarian Parliament Building, and so much more! As you wander around, make sure to check out the Liberty Statue. There is a cafe and museum as well. For summertime, I recommend you enjoy a Chimney Cake ice cream cone as you sit at one of the benches and just take it all in! The best thing I did in Budapest was a food tour with Taste Hungary. 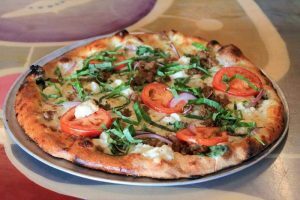 Food is such an important part of any culture, and learning how cuisine fits with the a city is always fascinating. 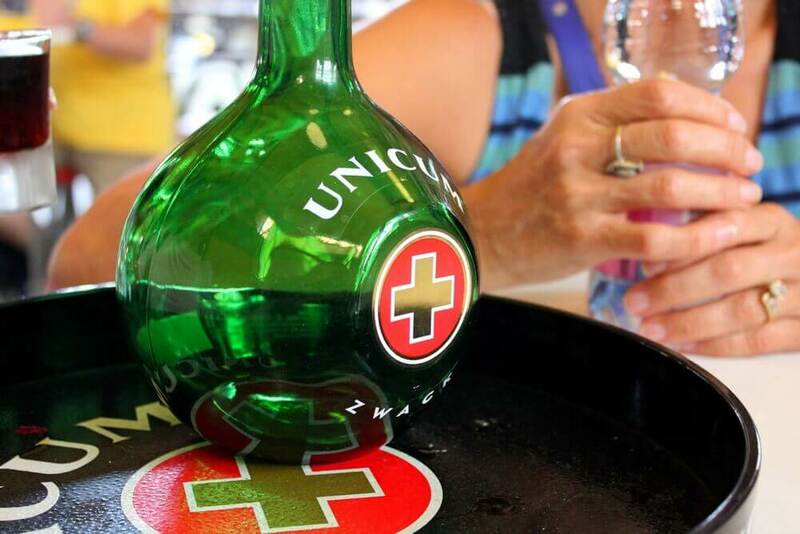 My tour started in the Central Market Hall, where we tasted Unicum, Hungary’s national drink, and learned the history behind how the recipe was affected by communism. We also ate langos, cheese, and several types of salami (including horse!) before setting out from the market. Next up was lunch at a restaurant that used to be a butcher’s shop. This place was so good my husband and I returned later on our trip for another meal. But, as if we hadn’t already eaten enough, our guide then took us to a cafe for cake, a candy shop for sweets, and finished the tour with a wine tasting. I enjoyed everything I had on this tour, and it was such a fun way to learn more about Budapest and Hungarian food culture. Our guide also gave us a list of other restaurants in Budapest that they recommend. That’s why I highly recommend doing this tour early in your visit. One of the major attractions of Budapest is its fascinating landscape. The Danube River cuts the city in two halves: the flat side of Pest and the hills of Buda. The best way to enjoy this captivating scenery is by hopping on tram Nr. 2, which follows the Danube River on the Pest side of the city. The views from this tram are simply astonishing. You will see Buda Castle, the Buda Hills, and the Danube River with its many bridges, including the famous Chain Bridge . 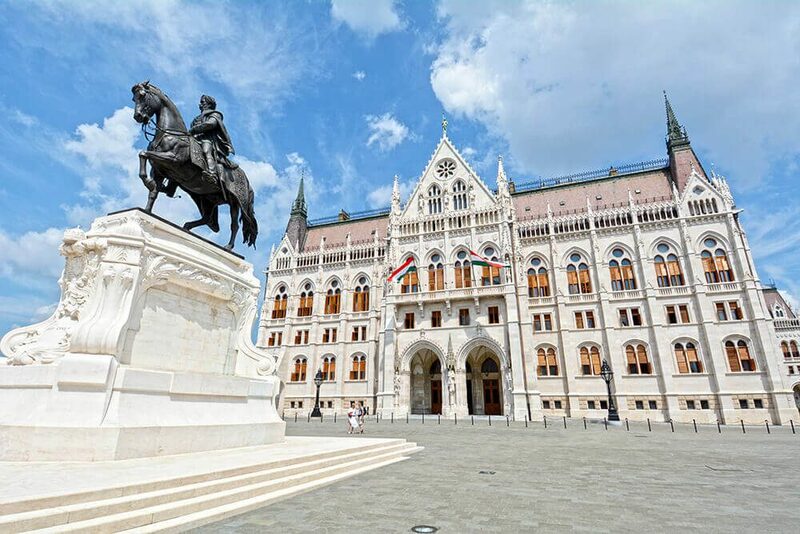 On the Pest side you will pass near the Parliament (one of the city’s most well-known buildings), the National Academy and other important historic landmarks. And the best part of this journey – the ride is on a public tram, so you can get a single ticket or choose from a number of multi-day ticket options. I recommend taking the ride around sunset or after dark. That’s when the bridges and the most famous buildings are nicely illuminated. Located in the heart of Budapest’s Jewish Quarter, the Street Food Karaván is the perfect spot to eat yourself silly as you sample all the delicious foods Budapest has to offer. 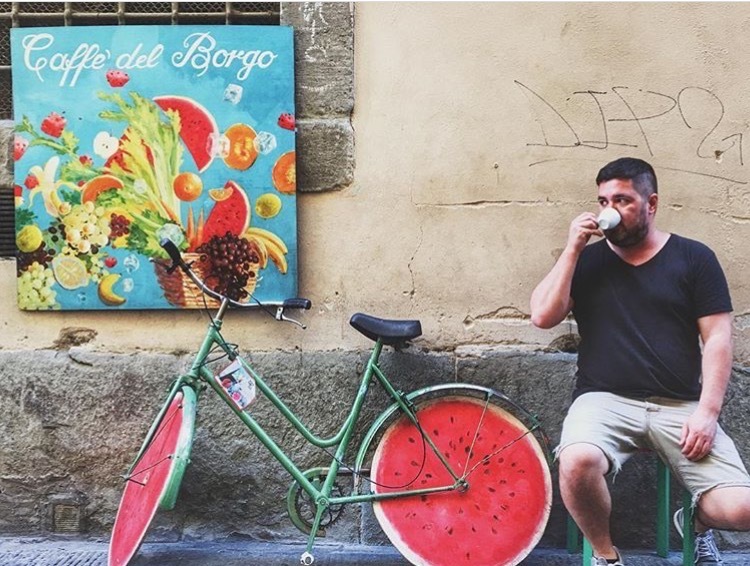 The food trucks/vendors here have everything – from traditional Hungarian dishes to sweets, healthy and vegan options, and also those heart-attack-on-a-plate-but-oh-so-delicious dishes. This is also a great place for friends of picky eaters, because EVERYONE will be able find something they like. 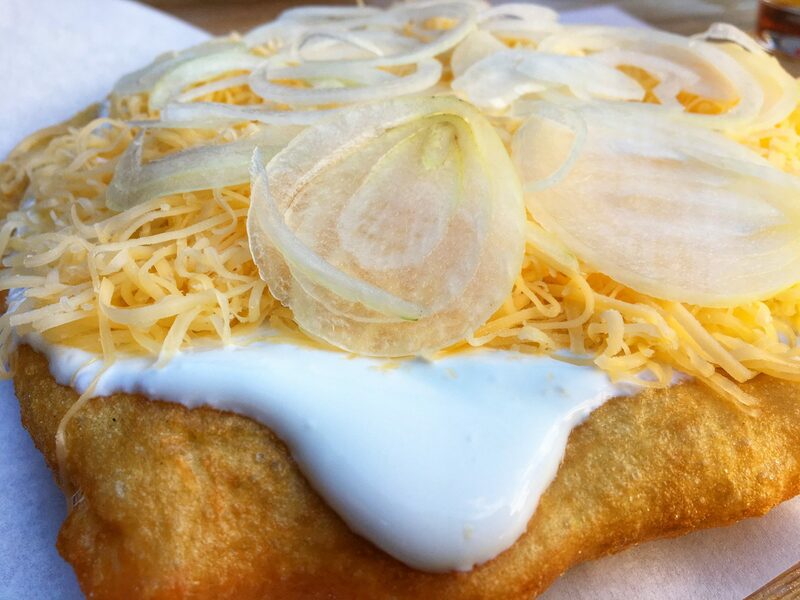 One must-try is the Lángos, a Hungarian style flatbread heaped with sour cream and cheese. If you plan to head to the ruin bars after, this is the perfect choice. I recommend you go with a bunch of friends (or strangers you’ve met in the lobby of your hostel). That way you’ll get more opportunities to try the delicious food at Street Food Karaván! 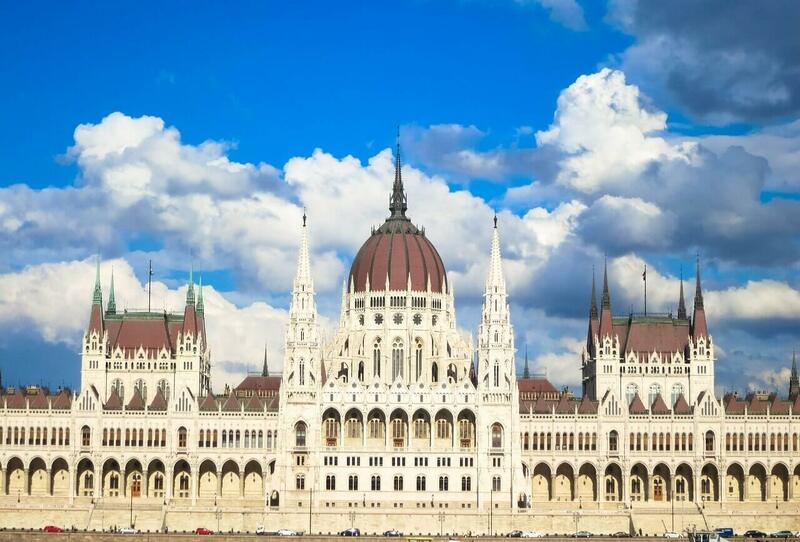 If you visit Budapest, you must take the time to visit the Hungarian Parliament Building (a.k.a. the Parliament of Budapest). One of the most famous tourist destinations in Budapest, this notable landmark is located on the banks of the Danube in Lajos Kossuth Square. The Parliament is also the tallest building in Budapest and the largest in Hungary. While it’s stunning during the day, it’s lit up quite extravagantly at night. You won’t be able to visit the building without a guide, so make sure to book one before your visit. Inside, you’ll get to see the Holy Crown of St. Stephen, one of the greatest treasures of Hungary. The structure’s symmetrical design hearkens back to the Gothic Revival style, and its famous for its sixteen sided central hall. Other interior design features include stained glass, mosaics, frescoes, and sculptures. Don’t leave Budapest without visiting this unforgettable national monument! If you’re into unique places to drink and socialize, you’ll find no better place in Budapest than the city’s ruin bars. These bars get their name from their structure. Outside, they look like abandoned buildings on the verge of collapse, and inside they aren’t much better. The furniture is mismatched, the walls are unpainted, and in some cases, the doors are broken. You’ll find scattering of paintings and other artwork. When Szimpla Kert, the first ruin bar, was founded in 2004, it was a sort of underground club full of locals, not tourists. That still held true when I went to Instant a few years later. 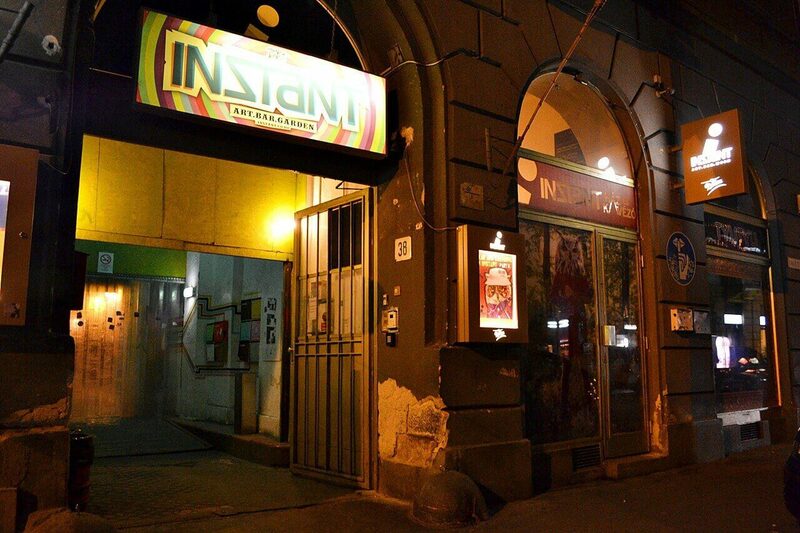 Instant, which used to be an apartment building, is the largest ruin bar in Budapest. The bar has several floors, and the old walls between apartments have been taken down. When I went, there was a DJ and a dance floor, and I had a great time drinking beer with a Couchsurfing friend on one of the sofas. Nowadays, ruin bars are more of an open secret than a locals’ hangout (as they’ve been written about in CNN and other popular blogs). Hopefully they have retained their character despite the influx of tourists. With its ruin bars and party spas, Pest is an attractive destination for young travelers. However, this side of the city also has a more striking pull: the Hungarian story of torture told at the House of Terror on Andrássy. As visitors walk the house’s four floors, they will learn about the two terror regimes locals have faced through audio guides, images and artifacts. Exhibitions cover the periods of terror caused by the Nazi and Soviet invasions. The museum serves as a memorial to the victims of these regimes, including those detained, interrogated, tortured and killed in the building. The self-guided audio tour takes around 2-3 hours and is well worth a visit for those looking for alternative things to do in Pest. Go Cave Diving – Yes, In Budapest!! Budapest is full of attractions – both above ground and below. You can visit the underground secret hospital museum or explore Budapest’s caves by joining an organized spelunking tour, but the most unique way to explore “underground Budapest” is to dive the little-known Molnar Janos Cave. Molnar Janos Cave is a destination for divers who want to truly explore Budapest cave diving. The cave has been a protected National Park since 1992, and only a select few are allowed to visit and dive each day. Each diver must complete necessary paperwork and undergo an intensive pre-dive orientation meeting. Due to the danger and the fragility of the cave environment, your Molnar Janos cave diving session will be very carefully monitored by the divemaster. The caves are pitch black, but with proper lighting, you’ll find see-through fossils, fascinating rock formations, and an endemic species of blind shrimp that exists no where else on earth. You might even hear the subway rattling above! Molnar Janos is a true adventure experience that you won’t soon forget. It definitely qualifies as one of the most unusual things to do in Budapest. If you are looking for a spectacular and unique experience in Budapest, I recommend you book a seat for a performance at the Budapest Opera House – it really is an amazing experience. Budapest’s glamorous Opera House holds creative arts performances by the Opera, Philharmonic symphony, Ballet and other performance groups. Events rotate constantly and are quite affordable compared to Western prices of this caliber. Once you enter the hall and catch sight of the grand staircase leading to your seat and elaborate interior, you’ll know you’re in for a very special experience. While visiting the city, check out my favorite places to photograph Budapest for more inspiration on where to go and what to do. Margaret Island, also known as Margitsziget in Hungarian, is a lush island located in the middle of the Danube river in Central Budapest. Here, you will find greenery and beautiful gardens alongside medieval attractions that will peak history lovers’ interest. Margaret Island is Budapest’s most popular recreation area. The island was once home to the Knights of St. John back in the 12th century. The remains from this period can be seen at the Franciscan church, which dates back to the 13th century. The Music Fountain hosts several music shows per day and is one of the city’s most popular attractions. The fountain’s water is synchronized to various songs. In addition to the Music Fountain, the island also holds a popular bath house and a beach where you can go for a swim. Nowadays, Margitsziget is also home to an increasingly popular festival – Sziget Festival. Top DJs and artists from all over the world come to perform. The festival is held for a week, typically at the beginning of August. The easiest way to get to Margitsziget is by foot via the bridges. You can also take the tram/bus or join one of the many tours in Budapest. If you’re in Budapest and craving something sweet, there’s no better treat than Dobos Torte. This classic Hungarian dessert is a 7-layer sponge cake filled with chocolate buttercream icing. The dish is then topped by a hardened caramel layer that forms a candy coating. The treat was created by József Dobos, a Hungarian pastry chef. While there are a handful of confectionery shops that draw the big crowds, many lack seating space. Luckily, one place stands out. Café Gerbeaud is one of the best restaurants in Budapest to try Dobos. Located facing Vörösmarty Square, this historic upscale restaurant and cafe has a massive patio area where you can sit and enjoy the hustle and bustle of city life. 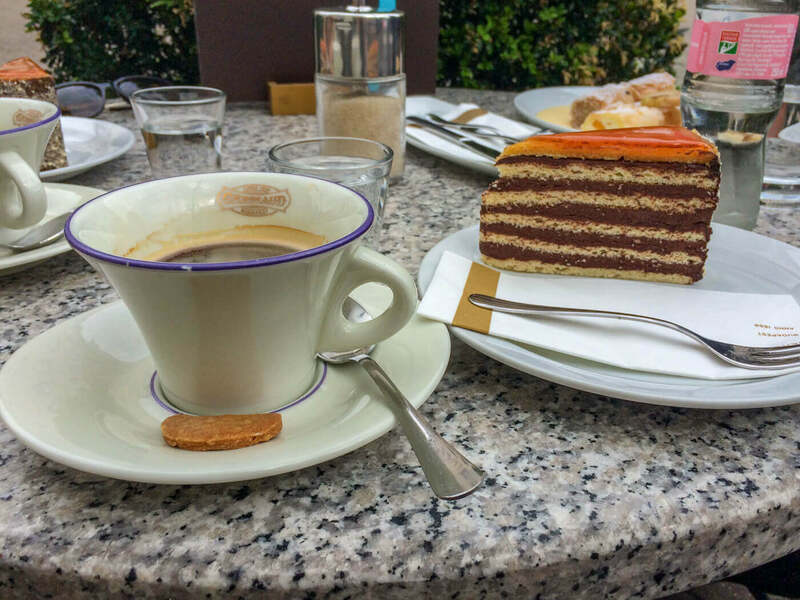 When you order your slice of Dobos, be sure to pair it with a hot coffee or tea! Szent Istvan Bazilika, or St. Stephen’s Basilica, is the largest church in Hungary. Located in Budapest, it is dedicated to Hungary’s first king, St. Stephen. Originally designed as a neo-classical cathedral, the basilica was finished in a neo-renaissance style after the dome collapsed. The cathedral took 50 years to build and can hold up to 8,500 people. The stunning interior is home to St. Stephen’s mummified right hand, Szent Jobb (Holy Right Hand). This is the most sacred treasure in Hungary, and it’s decorated with pearl and ruby bracelets and accented with gold leaves. I recommend you go up to the cupola, where you can take in panoramic 360° views of the city. The 96-meter high dome was meticulously built to be the exact same height as the Budapest Parliament Building. This design characteristic was meant to symbolize the equal balance between state and church in Hungary. You can enjoy one of several organ musical concerts performed within St. Stephen’s Basilica throughout the year. The spacious St. Stephen Square in front of the basilica offers terraced cafes and bistros. In the Christmas season, the square is transformed into a winter wonderland packed with people for one of Budapest’s several outdoor Christmas markets. There are plenty of food markets on the list of the best Budapest attractions, but the Central Market Hall is one of the oldest and the best places to explore the city’s many culinary options. 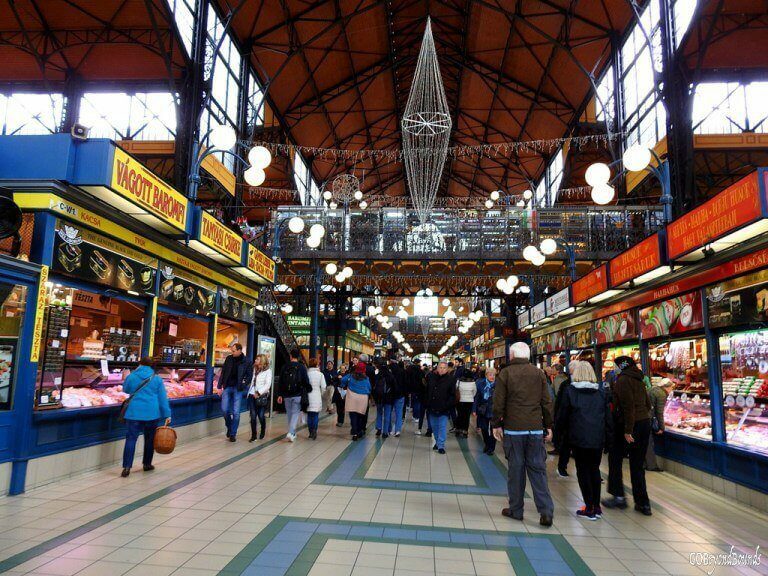 The Great Market Hall, also called the Central Market Hall, is an indoor market in Budapest spanning 3 floors. The market is located at the heart of the city, next to the popular Liberty bridge and just a 10 minute walk from the Deak Ferenc Square. The Central Market is located in a splendid Neo-Gothic building with a roof of colorful Zsolnay tiles. The Vaci Utca street opposite the market is a bustling place lined with restaurants and souvenir shops. The ground floor of the market hall sells fresh vegetables, fruits, and meat, while the basement holds shops for fish and pickled vegetables. You can try your hand at local delicacies in one of the shops located on the first floor. The first floor also holds many shops selling handicrafts and garments, making it the perfect place to go on a shopping spree. Note, however, that the market is closed on Sunday. Budapest is a dynamic city with no shortage of things to do. But when you’re not ruin pub hopping or dipping your toes in the thermal baths, I recommend learning about the city’s vibrant history. Historical Budapest tours allow you to dive deeper into different parts of Budapest’s past, like its communist history. Just a few decades ago, Hungary was under the rule of a strict Communist government. A walk through the city is like a visual history book, with the grey, box-like buildings telling the story of the city’s oppressive communist rule. As we walked by the UN Headquarters, we saw bullet holes from a student led anti-communist protest in 1956. We also saw the controversial Holocaust memorial, which has incited a counter-memorial set up in protest of the Hungarian government’s denial of their participation during the war. Although history tours have a reputation for being boring, we loved learning about Budapest’s fascinating past and recommend a tour as one of the best things to do in Budapest. 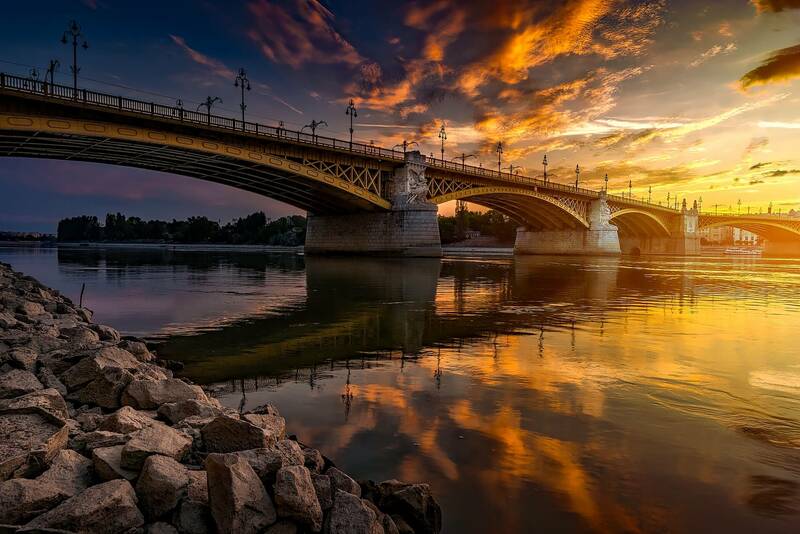 Witness the sunset over the stunning Budapest riverfront by jumping on a Danube ferry. The ferry ride is budget-friendly, and you can grab something from the bar to keep you company or even BYOD. The city’s public transportation company (BKK) runs three boat lines that depart from several different docks on both the Buda and Pest sides of the city. 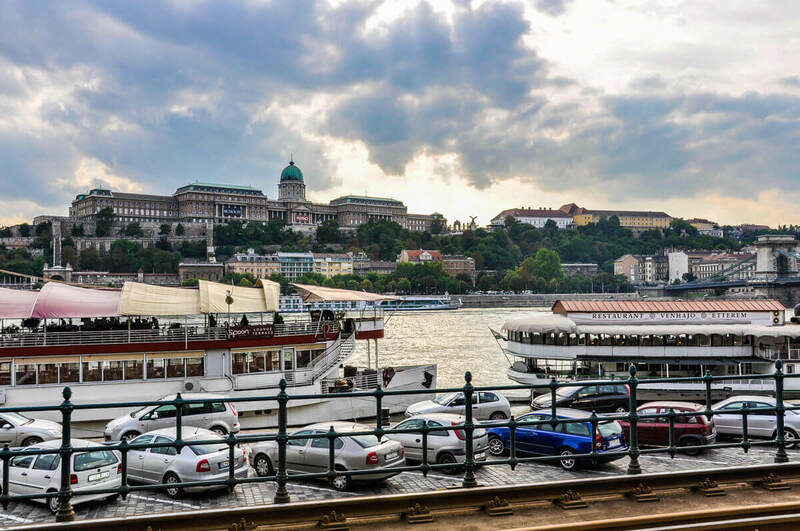 Waterfront landmarks such as Gellert Hill, the Parliament House, Chain Bridge, Danube Promenade and Buda Castle act as the perfect background for your cruise pictures. Some ferries even take you to Margaret Island, one of the best places in Budapest for a long walk. A Danube ferry ride is relaxing, fun and won’t break the bank. It’s indeed one of the Budapest attractions I enjoyed the most. Budapest’s New York Café is no ordinary cafe. The venue’s architecture and history is an experience in and of itself, and therefore this place should definitely make your must-visit list of Budapest attractions. 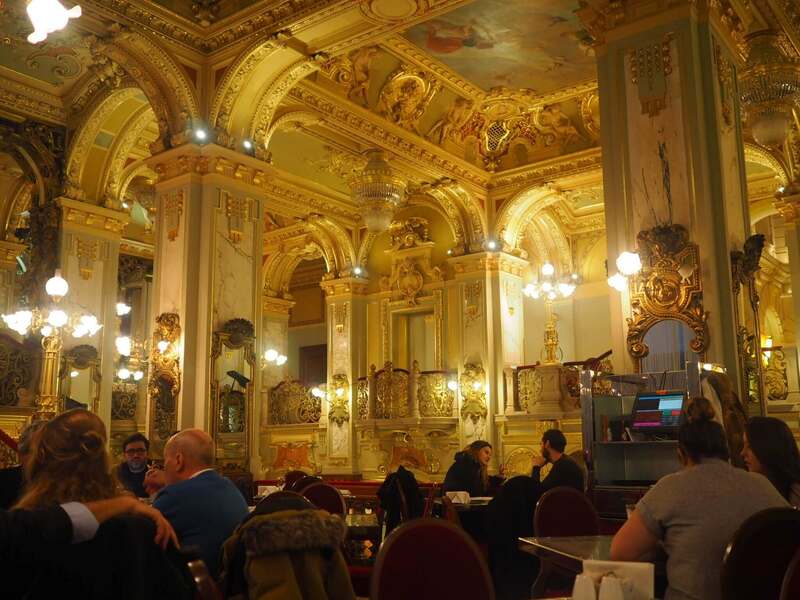 In the 20th century, the New York Café was one of Budapest’s most popular coffeehouses and also the home of one of the city’s most influential newspapers. After the Second World War, the building served as a sports store but was later reopened as a cafe in 1954. Today, the cafe is part of a hotel and is still a popular coffee stop in Budapest. The New York Café’s rich history and Italian renaissance-style interior is what attracts most visitors. But the menu should not be underestimated. The cafe serves multicultural cuisine with classic dishes such as Wiener schnitzel, chicken, soup and a variety of famous desserts. If you you’re looking to do something a bit different in Budapest, I recommend a midnight walk to Szechenye Chain Bridge. Chain Bridge is a suspension bridge that connects Buda and Pest – the two territories that make up the city of Budapest. The Chain Bridge was the first permanent bridge to span the Danube river; it was the brainchild of Count Istvan Szechenye, a leading political figure of 18th century Hungary. The bridge’s official name honors him. Made of cast iron and connected by chain links, the bridge has become one of the most important structures and symbols of Budapest. The entrances on both sides of the bridge are decorated with lion-head-shaped capstones. During the day, the bridge is an imposing structure. 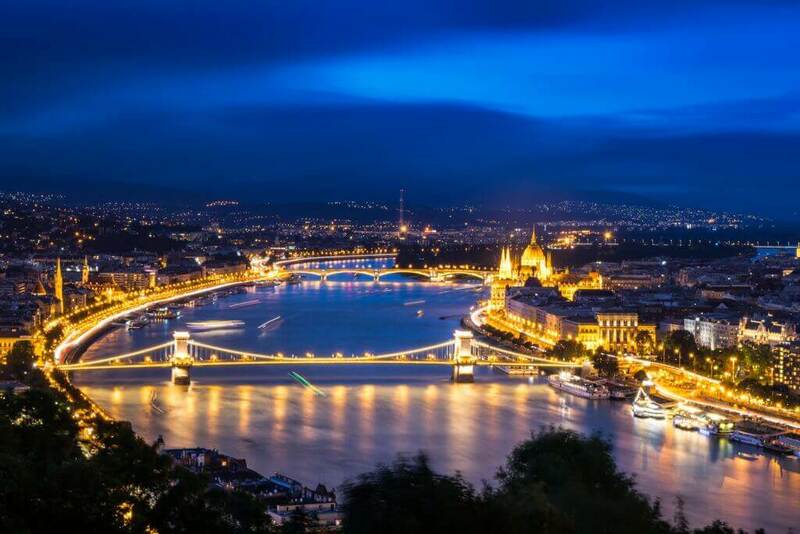 But at night, Chain Bridge transforms into one of the most scenic spot along Danube river. The light accentuates the dramatic structure, and from the bridge, you’ll also get to enjoy other important structures along the river. If you want to make your walk extra special, I recommend going at midnight, when there are fewer cars and people in the area. Up on Castle Hill along the Buda bank of the Danube, you’ll find Fisherman’s Bastion, a beautiful neo-Gothic neo-Romanesque terrace. The monument was built in the 19th century to replace defensive castle walls and celebrate the 1000th anniversary of the Hungarian state. The bastion is composed of seven towers, which represent the seven Magyar tribes that settled in the Carpathian basin. The monument and surrounding area are like stepping back into a fairy tale: the poignant towers, the beautiful stairway and of course, the view! Fisherman’s Bastion offers one of the most beautiful viewpoints in Budapest, and it is especially magical at sunset! The lower terraces are always open and free to visit, but there is a small entrance fee for the upper parts of the monument. There is also a chapel inside Fisherman’s Bastion, which you can visit for a fee. 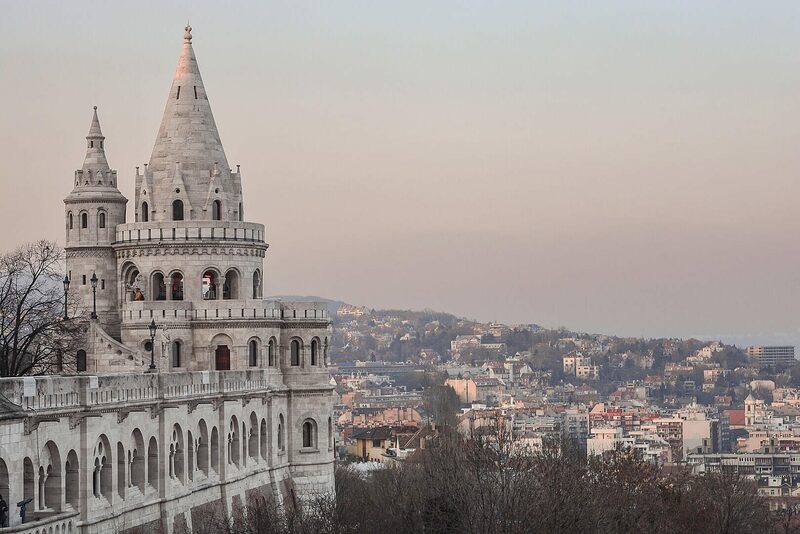 Right next to the Fisherman’s Bastion, you can find the famous Matthias Church. Along the distant outskirts of Budapest, far from their former stage of glory on the Hungarian capital’s central streets, you’ll find the bizarre sight of the city’s communist-era statues hidden away in a strange open-air museum known as Memento Park. Memento Park is an unusual memorial to Hungary’s former days of socialism. When the country threw off the yoke of communism, residents wondered what to do with all the statues that had been torn down. The answer? Take these statues, relics and pieces of history to an old sports stadium in the suburbs. Soon enough though, these relics of the past became a tourist attraction, an unexpected piece of history that’s now an almost Disney-like amusement park. At Memento Park, you can stare at Stalin’s massive boots, sit behind the wheel of a rusty Lada, or even jump on a weird communist hotline to hear the voices of all your favorite socialist characters from Lenin to Mao – all the while surrounded by brutalist, Soviet-style statues. When you visit Budapest and admire the city’s grand architecture, you might miss the more artistic side of the place, especially the capital’s street art. While Budapest might not be well-known for its mural scene, the city definitely has its moments. The best examples of street art can be seen in the Jewish district. Known mostly for its ruin pubs, this area of the city has the greatest density of high-quality street art. The district’s recent demolition left empty walls and a great opportunity for art to be created. You can find excellent murals by world famous artists throughout the 7th district, but don’t miss other forms of art too, such as stencils, stickers and graffiti. 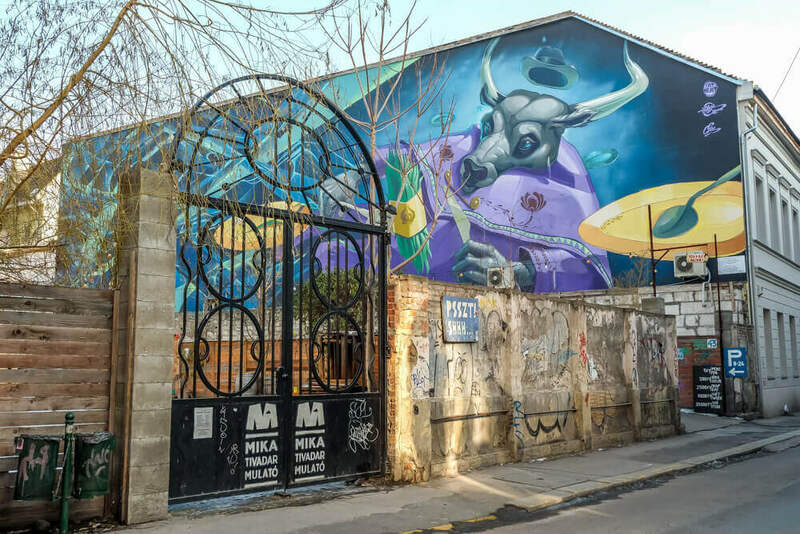 I recommend you download the online map of Budapest street art and explore the alternative face of Budapest! Which of these Budapest attractions do you most want to visit for yourself? Let me know in the comments section below! I hope you make it back soon! It’s such an amazing city. I really do love it so much. These suggestions are fantastic – definitely adding to my list! Karaván Park just made its way to the top – a park *and* delicious food? Count me in 😉 I also had no idea there was a beer bath – I tried the one in Prague recently, and now it’s time to visit this one in Budapest! Thank you! I’m glad you like them. Yes, the beer bath was very cool- one of the most fun things we did while in town!